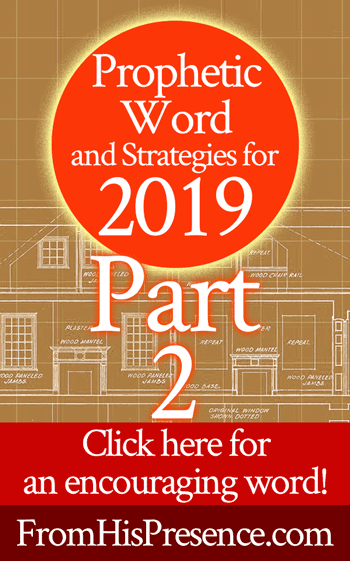 A few days ago, I released the first part of the prophetic word for 2019 (with accompanying strategies) the Lord has given me. In that post, I discussed how I believe 2019 is like final exam week. Please be sure to read that post in addition to this one. The Lord is calling people back to their old place of contending–but contending is no longer going to be laborious; it’s going to be glorious instead. That is not to say that contending will be easy. I know it’s wonderful to hear prophetic words about next seasons being easy, and I love to read those words as much as the next person. But, that’s not what the Lord is showing me for 2019. The Lord is showing me that 2019 is going to be a challenging year. Final exam weeks are always challenging! However, I believe it will also be the most victory-filled year we as a Body of Christ have ever experienced. In order to see those victories manifest in our lives, we’re going to have to contend. YOU are going to have to contend for whatever you want the Lord to do for you in 2019. It’s not that Father isn’t ready, eager, and willing to pour out His blessings on you. HE IS. However, you passed a test recently. As a result of passing that test, you got promoted to a higher level. This higher level is a place in which you will experience higher-level warfare than you have ever experienced before. You will need to contend in 2019 because the Lord wants to bring you every victory–but you are now facing more opposition than you have ever faced. 3. Reclaim the night watches in prayer. People in the early church woke up to pray multiple times during the night. They prayed multiple times a day. King David of ancient times set aside seven special times a day for a praise break (Psalm 119:164). Our modern church has let the night watches–and the day watches, too, sometimes–fall to the ground. The Lord is pouring out an anointing for nighttime prayer that we have never seen before. The Lord desires to sit VISIBLY enthroned on all your circumstances. This is the year in which He will bring Himself more glory in your life than ever before. And if you want Him to do so, you are going to have to contend. What does it mean “to contend”? It means to pray violently, fiercely, knowing what outcome you want based on what the Lord promised you, and continuing to pray–refusing to give up until you get what you asked God for. Contending prayer is violent prayer. It’s not violent in the physical sense, but violent in the sense that contending prayer grabs hold of Jesus’ feet, climbs up in Father’s lap, and wraps your arms around Holy Spirit’s waist to hold Father, Son, and Holy Spirit captivated and compelled to answer now, specifically, and quickly. People who contend in prayer believe God. They get a word from Him, based on His written Word–the Bible–and they stand, refusing to give up. Contenders refuse to be silent. They give Him no rest until He does what He promised and makes His name a praise on the earth (Isaiah 62:6-7). Click here to check out the video teaching I just released on the pioneer spirit! Use coupon code “dream” today only to get 20% off this new class. And in 2019, the Lord is calling people to reclaim their place and time of contending. Many who used to keep the fourth watch in prayer have drifted away from doing so. The same is true of the other prayer watches as well. The Lord is calling us as His people to come back to both the watch and the places on the wall from which we have fallen. Reclaiming the night watches is going to be easy, starting now. You will find the Lord waking you and calling you to pray. You will have to overcome the urges of your flesh in order to answer, but you will find as soon as you do that your spirit will dominate over your flesh instantly. From today forward, you will feel a holy ease and anointing to reclaim the night watches in prayer. In many cases, losing sleep will not even make you tired. The health changes Father talked to me about here in this prayer for weight loss and health will help you not be tired, but Father’s anointing will do the rest. 5. You will also experience a new anointing on your prayer language in 2019. Father showed me that many people have let their prayer languages lie fallow. For many people, the gift of tongues has become to you like a common thing. Praying in the Spirit has felt like meaningless babble to you for awhile now. However, despite your feelings, your prayer language was never meaningless babble. It was always–and has always been–a key to unlock the heavenlies for you. You didn’t realize it, but the enemy was stealing your revelation and use of your prayer language by obscuring its wonder with fatigue and cynicism toward what felt like mundane charismata. Starting today, you are going to war with your prayer language. You will find Holy Spirit’s anointing on your prayer language like never before. Don’t be afraid to pray in the Spirit in the car, while you drive, while you shower, while you work, or any other time–even if social mores dictate that you do so under your breath. Your prayer language is the language of the Spirit, and He is unleashing barrages of declarations and decrees that will enforce His will on the earth. He is doing this through the prayer languages of His people. 6. Next, make a list of things to contend for. You need a prayer list this year. Even if you have never used a prayer list before, you need a prayer list now. You will feel the anointing of Holy Spirit on your list as Jesus pours out His Spirit of grace and supplication on you while you are faithful to pray. Jesus said that real faith is demonstrated by persistent, unyielding prayer. In 2019, be one of the people who have real faith. Make a list of the miracles for which you are contending–and not miracles alone, but everything that Father has laid on your heart–and stand on the wall in prayer until you see every one of them accomplished. 7. Also in 2019, ask God to open doors you never saw coming. Pray and intercede for double doors to open–and for the opening of doors and opportunities that were previously barred shut. Father God has allowed delays and hindrances in many things because the solutions you thought would solve your problem were not good enough. Every closed door means a better solution somewhere, for all things work together for your good if you love God and are called according to His purpose. Therefore, pray and claim God’s promise to open doors and shut other doors as only He can do. 8. Last but not least, 2019 is the year of the pioneer and the year of the entrepreneur. God has gone before you through a wilderness season and even into the Promised Land. Now, however, He is expanding your vision. He is re-awakening many, especially in the fields of business. Many failed business ideas have made entrepreneurs in the Body feel like failures. However, Father God sees all of it as part of His building process. He is going to place His hand softly onto entrepreneurs and visionaries in 2019, thrusting them out gently again into the realms of business. This time, however, it won’t hurt. “Many paths before you appear fallow, but one of them will blossom like a rose. You have done well, good and faithful servant, and have served me in ways you will not know until I show you your fruit in the halls of Heaven. 2019 is final exam week. It will be a challenging year in which the serious shall obtain everything. But it will also be a rewarding year, for you will see the greatest victories of your life manifest this year. To see those victories, you will need to contend like never before–but you will find the Captain and Lord of hosts in your prayer closet with you. His Spirit of grace and supplication is eager to work with you to glorify Father’s name on the earth, and you shall be the vessel of His praise and victory. Is Holy Spirit using this prophetic word for 2019 to confirm what He has already told you? If so, please leave a comment below! I’d love to hear what Father God is saying to you! Jamie this word has me so excited!!!!! I’ve been feeling a desire to pray during the hours of 3 am and 6 am but I would struggle to wake up and stay awake. I am also very excited to hear that this is a time to contend… I feel like God has been showing me that in baby steps, by contending for very small things to build my strength. My only problem is that I tend to struggle with striving. Please pray for a revelation from God about contending vs. striving and please pray that I would be counted among the serious ones. YES!!! I believe you will be counted among the serious ones, dearest Sandra. I believe you will. Big (((((hugs))))) to you!!! Yes it is conformation for me. I rarely comment, but I had to on this particular post of yours. For the past few days, I have been waking up between the hours of 3:00 a.m. and 6:00. I am using this time to pray for my family, the leaders of my church, it’s members, for others, and for my own healing, direction, and restoration. I have also been having quite emotional conversations with God — reminding Him of what I feel I need in order to fulfill His Purpose for me. This practice has been difficult at times as He seemed silent. Your sharing is such confirmation for me that I am on the right path — that I am being birthed and experiencing those pains as I move forward. But, I can be assured that He will supply my needs and continue to strenthen me as I move into new territory of taking risks and (re) building trust. I continue to pray for you, as well, Jamie. Thank you so much for all that you do and for who you are — a treasure. 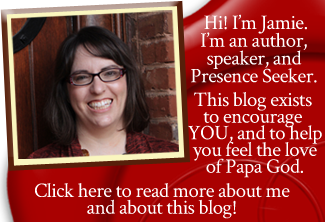 Hi Jamie this is my first time reading your blog and my God!!!!! You confirmed what I have yet to express about prayer and praying at night. I’m also an entrepreneur and I’m sitting here creating my content for may website and every time I finish something I hear keep going. 2019 indeed will be the year of the entrepreneur! Thank you God for this vessel Jamie. I pray that you Jamie continue to have your ears tuned into the voice of the Lord. God Bless you! Hi Karen! Great to meet you. I’m so glad you’re working on your website! May Abba Father multiply His grace and peace to you and help you do the work for Him and His Kingdom! So our spirits are always w Him I’m hoping because in the middle of my mess He had me write some things that scared me..after listening to Jesse (he’s a go getter). Then u came w the seven list so I’ve got 7 and 7 more. Also wants me to review the temptations again know in my knower. I’m excited about the prayer closet. A dear sister had meetings at her place and her prayer closet was electric. The world needs authentic love that meets them and I can’t but He can and does w million people at once he’s so cool. 1. Tears in heaven scripture ref. 2. Saints scripture ref. ? I am amazed, humbled and shocked by virtually every detail you shared. For the sake of time and space I will just bullet proof this. C)You say 2019 but three days ago after prayer I was led to the book of Ester. I am not a bible scholar but I believe the Holy Spirit led me study the months but it seems the main events in Ester happened in (Dec-Jan I might be wrong) and I felt the Lord was saying to me start CONTENDING. Thank you Jamie for being the mouth of God. God has given me many promises …Psalm 24 and Psalm 21 and I’m believing Him to perfect that which concernth me! Right now, I am in my midnight hour;contending with the giants that are occupying my promised land.But in Jesus Mighty name, I shall destroy them!They compass me about like bees but in the name of the Lord,they are quenched like fire of tongues! I and the children God has given me are made for signs and wonders!!! Two weeks ago, I had a dream about being a pioneer woman. I had on the dress and the bonnet like from little House on the prairie. This is the second dream of mine that you’ve confirmed, I just don’t know what it means. Hey Jamie. 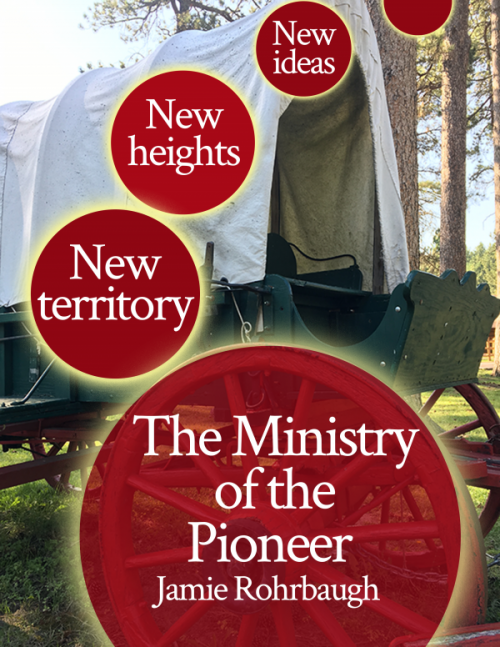 If you grab my video teaching about “Healing the Pioneer Spirit,” you will know what the pioneer thing is all about. It’s over on my Gumroad store if you’re interested – https://www.gumroad.com/fromhispresence – and the coupon code “dream” will get you 20% off today only. Have a super day! Happy pioneering! Our Father is amazing!!! I desire to be a woman of faith and to pass this test of a year 2019! I had enjoyed this post very much, my joy and strenth are renewed! Thank you very much?? What a powerful word! So spot on. The scriptures also tally with what the Lord has been saying to us, l agree completely and ask for grace to stand upon my watch , grace to contend until his word manifests, and grace to stay in His presence till my rod buds, and blossoms like a rose. Hallelujah! God bless you beloved sister, for this ministry. On Monday I couldn’t sleep went to bed at 10.00pm at Eleven I was awake then went back to sleep woke up again at 1.00pm I started praying though in my heart by three I still could not sleep so I woke up and decided to get busy. I was reporting to work and trust me not a single minute did I feel tired or as if I didn’t sleep through the night. I give God all the glory and for using you and bringing us this revelation from the All Might, love how He confirms his word. “He made known His ways to Moses, His acts to the children of Israel” (Psalm 103:7 NKJV). Amen! Elizabeth, a similar thing happened to me. Glory to God! I’ve been struggling though the nights for a LONG time (thanks to abuse) and have been turning, in tears fears and desperation, to podcasts, bible and prayer from around 3-6am. Thank you for giving me new vision and hope for this time slot, and freedom to stop yearning for sleep instead. I am an ‘infant’ in all this, and am just learning how to pray, how to connect with the presence of God who seems SO distant in the most troubling of times. But HE IS THERE. And He DOES care. He sure does care, Nina. I’m proud of you for seeking Him during that time! And as you continue to seek Him, He will reveal Himself to you more and more! I have my 7 , I am statements on my side as I write this comment . Thank you for the Part 2 Prophetic word and strategies . I always pray at midnight from 00:00 – 02:00 am but it’s almost two weeks now Jamie that I find it so difficult to pray . Wake up yes I will but I will remain so quiet , in my heart I will only thank God .I will only thank Him without saying a word of prayer ,from there I will go to sleep . Jamie if this is a problem in my prayer life , please pray for me because I feel I need to contend . God bless you for the Prophetic Word And Strategies for 2019. I just read your comment and felt led to reply. I have recently been feeling oppressed when I attempt to pray aloud — as if I’m tired of hearing my own voice. In combination of recent messages I’m receiving at my church and now through Jamie, I truly believe this is the enemy attempting to discourage us my keeping us silent. I just started a study at my church on Battlefield of the Mind by Joyce Meyers and our pastor warned us of how Satan would be working overtime as we dig into this particular study. The weapons that we have been introduced to thus far are Prayer, Song, and Scripture. Playing worship music clears oppressive energy, reading Scripture out loud, and having REAL conversation with Jesus — without following a script but with respect, and acknowledging His Sovereignty and Power which forces the enemy to flee. Satan is so sneaky — so devious & he has been studying each one of us for a long time. He knows our weaknesses and insecurities and plays on them. Continue to fight back through these weapons, and know that I am praying for you, too. Yes. This is in alignment to what the Lord has been sharing with me. Thanks again! You are a huge blessing Ma’am. I have been hooked to your website for days. I even write out the prayers into a book. I’ve been going through hard times upon hard times, but i found the answers here. You make meaning of scriptures i normally meditate and move on so powerful in my heart. May you continue to yield to God as He uses you for His Glory. I am glad i found this site. God’s love is more real to me as i read your blog. God’s Grace! This is powerful word. Shortly as I finish praying I was lead to open my email to check I saw the message its got my attention, Behold I saw the word go has for me. It’s really motivated me spiritually the more. More grace to do exploit Woman of God. SO MANY THINGS. First, the mention of the re-awakening of vision is EXACTLY what I’ve been praying for recently, and this deep burning in my soul that I can’t turn off to leap into business, even though I’m still figuring out what that even will be! I’ve been a homeschooling SAHM to my 7 kids for 13 years and I know the Lord is leading me to let this be our last year of homeschooling. It is time to trust Him entirely, even that He will go before my children as a better provider and protector than I can hope to be (fear has been a major player in my homeschooling decision). And this morning I was awoken by three loud knocks on our bedroom door that I swore was one of our children, but when I got up and opened the door, no one was there and not one child was even seemingly awake (it was just shy of 6am). I had a sense it might have been the Lord, but I blew that off as silly. If that happens again, I’ll surely be ready. It has happened before, but just as Jamie mentioned about letting certain disciplines fall aside because of thinking them “charismatically embellished,” I have not trusted them quite so much as before. No more. I desire that deep connection with my Abba again, and the amazing beauty of spiritual oneness with intimate prayer. It’s time to contend. YES. CONTENDING in 2019. Proud of you, Julie! Warrior queen you are! Thanks Jamie for this word. This is a confirmation why the strong urge to shift my prayer vigil to 3 a.m why am seriously contending for prophecies spoken over my life. And over the promises of God. I seriously didn’t think I’d make it 2018.but God held me and I sailed through it inspite of it all. Lord I thank you. Thank you for your response on the battlefield of the mind , I am sorry I responded so late ,unforseen domestic matters needed my attention . You are really a God send , now I know that even though I am quiet I should know that the enemy is at work . Thank you for the weapons that you mentioned that I have to use to make the enemy flee . Most of all this Jamie is knowing that you are praying for me .I did not know that I was under oppression even though this state was worrying me a lot . Thank you woman of God , may He continue to elevate and use you for His children here on earth . God richly bless you . Hi Rebecca, that was actually from me, Bethany, and I am so glad that you found encouragement and insight as I also have. Jesus is indeed with each one of us and is our Protector, and in the end, He has the final word. Thank you Father has been waking me up again during my previous 4th Watch Prayer Time and I have noticed previous paths reappearing. Th word of God in Isaiah 45:1-3 surely is the word for the season and again the wold in Hebrews 4:16 is powerful. Saints of God lets proclaim and believe the world of God for it yes and amen. God bless you and answer your heart desires in 2019. This is indeed the WORD OF THE LORD for me personally. Thank you for giving us divine trategies in order to lay hold of what the Lord has for us under the Anointing in Jesus Name. Hello again. The Lord will perfect that which concerneth me! To God be the glory for you obedience. I just can’t tell it all!!! I come from Kenya. The first time I read the prophetic Word on 18th January 2019 the Lord helped me to pray. I slept at midnight because of the work I was doing and was exhausted. The Lord swept me with the prophetic Word that I had read in the day I woke up 4 times to pray by the time I was waking up fully it was 6.00 am and I did not struggle at all. I did many extra ordinary things in the day. it has been a great experience in God’s presence that has continued and I confirm that this is the Word of the Lord to contend in 2019. Blessed be the name of the Lord. Your materials are such a blessing. Back in October there was something that I really wanted from the Lord in relation to ministry traini ng. There were some big obstacles. As I prayed aski ng God to open doors for me, I felt the Lord say, “contend”. In other words, I was going to have to contend for it, not just in the spirit realm but in the natural as well. As I did that in obedience, he not only cleared my path, but supplied full provision for it. Once I did the small amount of contending I had to do (which seemed huge) the rest was indeed easy. I believe that word still applies and that this is no time to be timid. Thanks Jamie for confirming what I believe God is speaki ng to me too!! This word is right on time for me ! The Lord woke me up at 4:40 this morning and told me three times loudly to WAKE UP! So I finally got up and prayed in the Spirit this morning. This is a confirming word for me. I actually woke up sometime after 3 this morning and I remember thinking about the night watch. Also, an intecessor friend of mine asked me last week if my husband and I had a business. At the time, I replied that he and some friends had one, but forgot that I had opened an ETSY shop back in November (mainly because I had not made any sales. This week I made my first . Wow! Right on point for my ministry and personal life. I love what God is doing through your life and in your life. You really heard our Abbah Father. This is amazing. Parts of this are a confirmation for me. I will be contending! As I came out of 2018 into 2019 the Lord spoke to me that I needed to be adamant and fight going into the new year. Your word definitely resonates with me. Your blog has inspired and helped me more than I can even put in words. The HolySpirit used your posts to bring me so much comfort and clarity. On the part you talked about entrepreneurs, I was blown when I read it. Reason is because, this evening a Pastor who holds Wednesday prayers on IG every Wednesday with women ( handle is @rtwni) said EXACTLY what you said. Indeed, the Spirit of God is ONE! To him be all the glory and may he bless you too. AMEN. The Lord said this year he would reset,recalibrate me! This year I have a big shift to overcome in my business. It is not easy for me. This word is confirmation that The Lord will provide. Thank you!